As of late, you’ve most certainly ran into an article or two about Weird Al Yankovic, the parody singer who 9 times out of 10 causes a riot with each new track release. Though he may unnerve many people (including myself at times), he is pretty great at what he does (which is nothing special) and his songs are released on iTunes, Amazon, and Spotify, and he has 1,000,000+ followers on Facebook. Appalled? Yeah, I thought so. Let me remind you, he does nothing special. Everybody parodies famous songs and posts them to YouTube; that is nothing new. But, Weird Al Yankovic has grown to be a popular artist over the years; he is a constant news headline and makes a ton of money. 3. He isn’t afraid to hurt people’s feelings. 4. He takes a stand, and doesn’t falter. 5. He uses social media in his favor. Now, how is this related to business? Well, let me explain. Each of these characteristics are also characteristics of successful businesses. If you’re feeling like your small business has plateaued, and you just can’t attain the recognition you feel that deserve, then you probably aren’t optimizing your existing resources. See, each of these characteristics are extremely easy to attain, but most startups are too scared to push the limits. They think they need to maintain a prim and polished brand identity in order to be successful. Though prim and proper are exceptional in some cases (customer service for instance), prim and proper will not help you stand out in a crowd full of entrepreneurs. Don’t be afraid to ruffle the feathers! It may be your key to success. 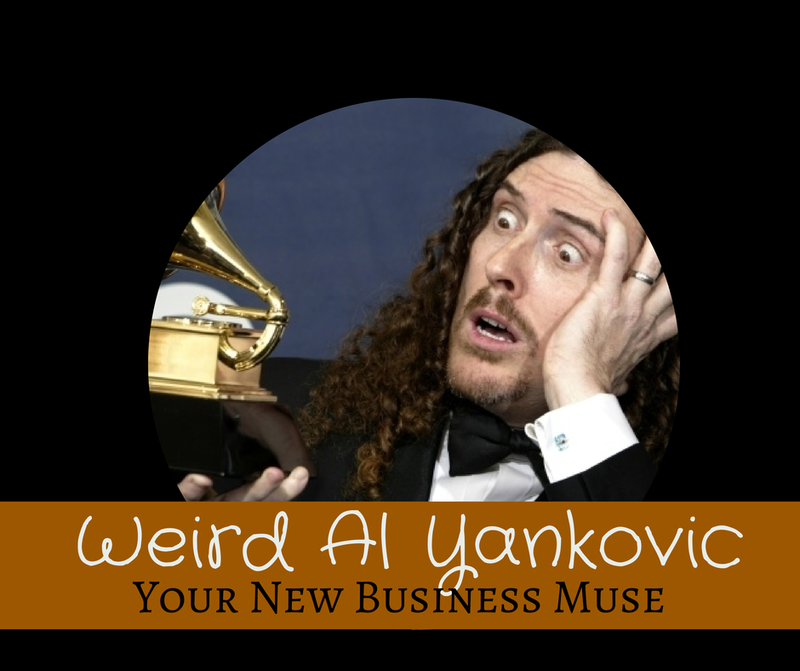 Here’s how you can apply Weird Al Yankovic’s unique brand to your small business identity, without warding off potential customers. 1. Be unique. Before you launch any marketing campaign, it is crucial to identity your competition. Crafting a complete competitor analysis is never a waste of time. Monitor what your competitors do, and do it better. Scratch that, do it better and different. What kinds of content are your competitors posting? What does their marketing strategy look like all across the board? Figure out what works for them, and what doesn’t. Optimize their blunders and search for ways to tweak their strengths and make it your own. Five people cannot climb the same ladder, there isn’t enough room. So take a step back, and search for another ladder. You’ll actually make it up that one. 2. Brand yourself based on this “uniqueness.” So, you finally have a grasp on the tone of voice you want to attach to your small business. Great! Make sure that every single marketing campaign lines up with this tone of voice. That is branding. You cannot provide a unified front if you don’t carefully construct every single marketing technique with the same tone of voice. Plus, your customers will be extremely confused. We don’t want that. 3. Be bold. As a business, you don’t want to hurt people’s feelings; that’s definitely not the way to go. But, you are allowed to be bold. I’m not saying to completely change your content marketing plan, and focus on arguing all of the controversial topics you can think of; you should actually avoid blogging about controversial topics (death penalty, abortion, gay rights, gun laws, etc.). What I mean is: say it like you mean it. By “it” I mean anything. I have written countless blogs about business tips and marketing tips knowing very well that some people will not agree with what I have to say. Not that I don’t care if someone agrees with me, I greatly enjoy a hearty banter every once in a while, but I do write with purpose, and honestly those blogs are the ones with the most hits. 4. Take a stand and do not falter. This characteristic is very similar to number three, just amplified. The same rules apply with controversial topics–avoid them like the plague. What you can do is research the hot topics in your industry and identify the heated debates. Then, join the conversation! You can do this by blogging, hosting webinars, establishing a social media campaign, join G+ communities, etc. Just make sure you remember basic conversational etiquette. 5. Use social media as a tool. Oh, social media. I could write 100 odes to social media. Not just because I “Tweet” for a living but because it is a phenomenal tool to propel your business. You can use social media in your favor, or you can forget about it and lose out on a 7,000,000+ audience of millennials. Let social media work for you, and let me teach you how. 6. Be funny! You think your B2B is destined to be soggy and boring? Ugh, no way Jose! That is a serious misconception. For the love of turkey and gravy, have some fun with your B2B and B2C marketing. You don’t have to be a stand-up comedian to add some humor to your social media posts, blogs, or even your customer service conversations. Our most successful Trade Only salesperson whips out a joke or two on the phone with her customers, and they love it. If you can’t have fun working, change your perspective. Now, if you thought you couldn’t learn a thing or two from Weird Al Yankovic before you read this article… Do you believe me now? It is absolutely not true that Weird Al is “not afraid to hurt people’s feelings.” On the contrary, Al takes pains not to offend or hurt people. For example, in the new song “Word Crimes” he sings the line “you write like a spastic” and garnered some horrified reactions against what the commenters considered a derogatory term for people with cerebral palsy. Al promptly responded via his Twitter account, “If you thought I didn’t know that “spastic” is considered a highly offensive slur by some people… you’re right, I didn’t. Deeply sorry.” And if the artist of an original song is not on board with a parody, Al won’t release it. Over the years, the hallmarks of Al’s career have been painstaking hard work (yes, Al is doing something silly, but he does it with complete seriousness), positive personal relationships and cultural savvy. Al has met thousands of fans, and he is unfailingly gracious and attentive to them. And the people who work with him? He’s had the same band line-up for his entire career. A writer who worked on his short-lived children’s show, in stressful circumstances and plagued with interference from network oversight, was asked “Would you work with Weird Al again?” He answered, “There are very few jobs I wouldn’t quit to work with Weird Al again.” Musicians respect the musicianship of Al and his band, comedians respect his comedic chops. All these relationships are bearing fruit for him now, with this last album’s success. I would say the lessons Al has to offer are: Work smart. Work hard. Treat people right. Don’t take yourself too seriously. Pay close attention to your market. Not necessarily novel, but it works. Thank you Helen for your insight, I am grateful to hear another point of view!